Continuing from the kitchen, past the kitchen-side entrance to the dining room on the left, to the right is the Family Room. 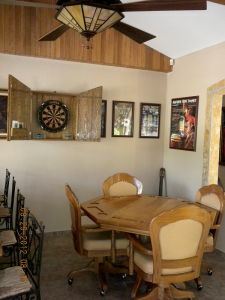 The family room is light and airy, with two wide, floor to ceiling windows and glass door leading to the covered patio. 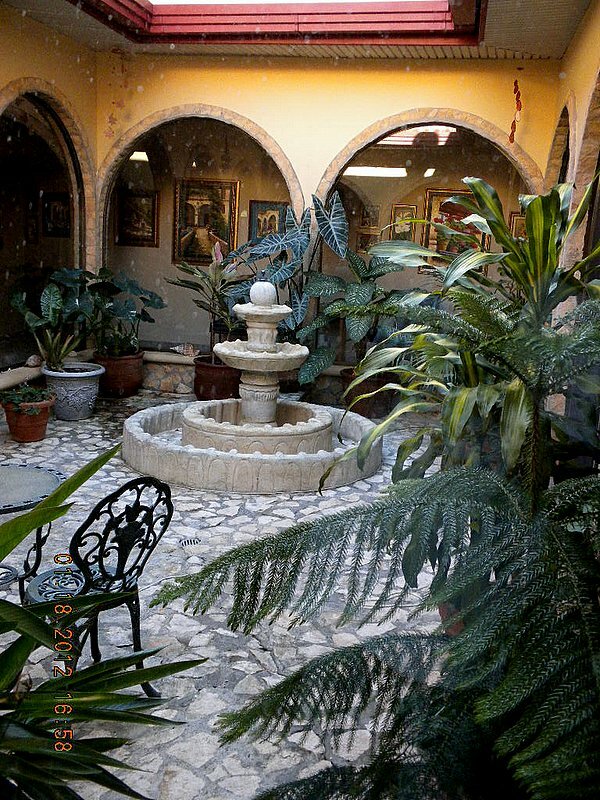 From the passageway, access is through a large open, stone decorated archway on either side of which are open arched glassless window type areas all giving a beautiful view of the central courtyard, tropical plants and fountain. The room boasts a stone fireplace with no-vent gas logs and raised hearth; custom wood cabinetry with display shelves incorporate space for a flat screen TV (that can be hidden behind slide out doors), DVD player, plus drawers, built to size, to hold DVDs. 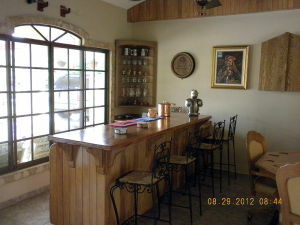 On the opposite side of the room is the “game” area with a beautiful bar of mango wood to serve up those tropical cocktails or perhaps a glass of chilled wine from the glass fronted wine cooler incorporated under the bar. 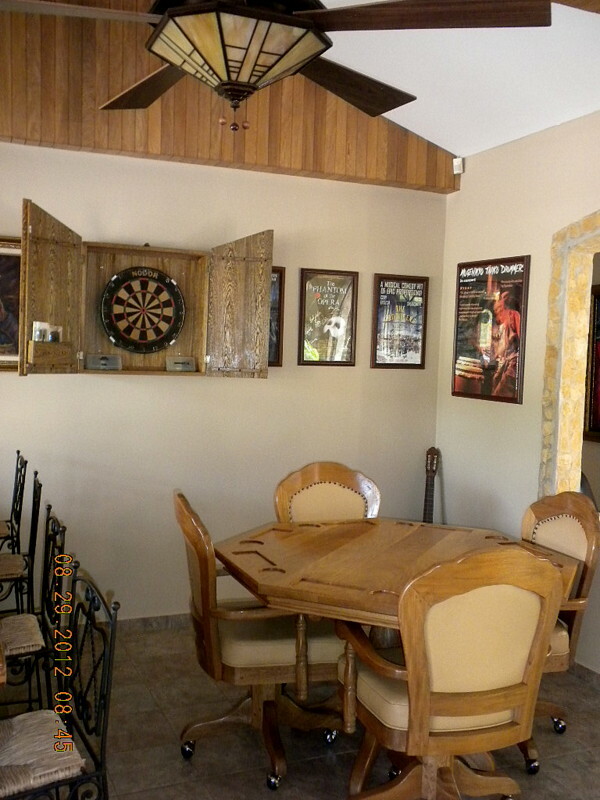 An oak card table and padded captain’s chairs continue the “game area” theme while housed in a specially designed cabinet is a dart board (just like an English Pub). 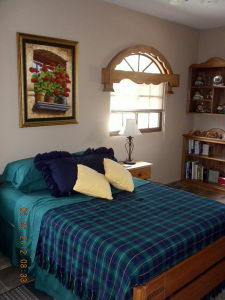 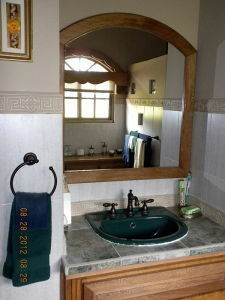 A truly beautiful but comfortable room, enhanced by unique, customized oak beams with complementary wood finishes on the upper areas of the two end walls. 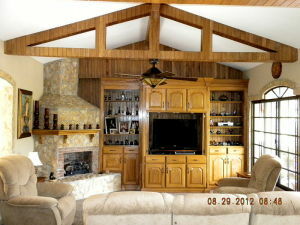 The exceptional custom wood finishes accents the openness and airiness of the main living space.